Relive the age of classic rock and roll in Brand New Me, a fabulous show that looks at a number of timeless issues and addresses them in a fun and contemporary way. 12 songs evoking the sounds of the period are featured and performed by a number of different chorus groups like the local kids, people at the dance and staff at the milk bar. The size of the cast can vary from a small cast of 30 - 40 all the way up to 70 - 80 if needed. If your cast is on the large side then having large groups of children make up each of the different choruses to accommodate everyone is a great idea. In addition to these chorus groups there are 10 main characters who perform the majority of the spoken dialogue and are what link each performance piece together to make a cohesive and enjoyable show. For sets, only two are required: the milk bar and the dance hall. A simple painted backdrop and a few easily portable items can establish both of these settings making for an easily staged show. All of the kids in the 'in crowd' are excited about the big dance on Saturday night and rivals Paula and Cindy both plan to convince Brad, the coolest guy in town, to take them. Everyone is going except Lizzie, the dowdy waitress at Nick and Gina's milk bar. Lizzie has a heart of gold but doesn't have the money for the latest gear and the 'in crowd' tease her about her look which makes her feel lonely and isolated. However, Lizzie's friends hatch a plan to help get her to the dance. Nick proudly drives her to the hall where she makes a stunning entrance and even catches Brad's eye! Paula and Cindy learn that it is the person you are and not what you wear that is important. Brand New Me is a fabulous show that addresses important issues such as peer pressure in a fun and contemporary way. 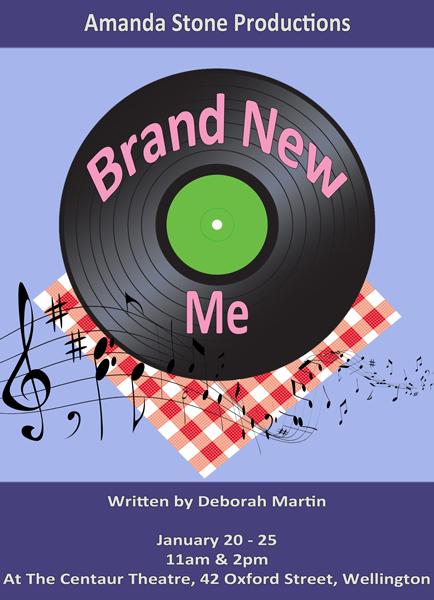 Brand New Me can be performed by a smaller cast of 30 - 40 children or with a larger cast of 70 - 80. In the latter instance it is best to have a core cast who play the main roles and large groups of children who enter and exit together to perform the big song and dance numbers. To create more roles some children can be dressed as buskers and entertain the audience before the show starts and during the interval. The show features 11 main characters who are supported by 2 larger groups. The first of these groups is the 'in crowd' who are the cool kids who hang out at the milk bar and go to the dance. The helpers are the second group and the ones who assist the main character, Lizzie, with her transformation. These two groups are involved in the performance numbers but some of their members also have small speaking parts. The first of the main characters and lead of the show is Lizzie, a character who transforms from being sad and sorry to brimming with confidence by the end of the show. This role requires a strong actor who is also a strong singer as it involves a solo. Cindy and Paula are characters who should go to strong, brash and uninhibited actors who don't mind playing nasty characters. Both of these roles also require good dancers as the characters are involved in a number of different dances. Trev and Tony are a couple of daggy characters who would be well suited for strong singers since they are required to lead a song together. The character of Brad is shy and reserved but also funny due to his undying devotion to his car. He is supported by his two mates Arthur and Bill who are trying to convince Brad to spend more time on himself and less on his car. Margie and Patty are waitresses who work at the milk bar and are good friends with Lizzie. Both of these roles require good singers and dancers. They are also friends with Peggy Potter who assists with the transformation of Lizzie. Lastly, there are the kind and generous owners of the milk bar, Gina and Nick. These two roles also require strong singers and dancers in order to lead the lovely song, 'When We Were Young'.